SEOUL, Korea (Jan. 8, 2018) – The male heavyweight category is a top draw in any combat sport – and so it is with taekwondo. But in no other weight category in the game have so many top athletes lost their form since the Rio Olympics, meaning the winner of this category in the Grand Slam in Wuxi defies prediction. There has even been a generational change since the Worlds in Muju in June 2017. Previously the category was all about size, strength and physique. Now it is more about speed, technique and experience. The top seed is 2016 Olympic Champ Radik Isaev of Azerbaijan. He is tall and strong, with a very difficult style to fight, but his form has deteriorated since his Rio triumph. As per the match tree, Iran’s Sajjad Mardani and Korea’s Seung-hwan Lee are placed to fight him first. Mardani failed to medal in Rio, but came back to win the Grand Prix Final in Baku in 2017, but has not had a significant victory since then. However, Team Iran needs a victory, and Mardani is powerful and hungry. Lee is an unknown quantity: He qualified not via Olympic rankings, but via the qualification tournament. Fans will hope that this dark horse can offer the same stellar level of performance as fellow Korean Hwan Namgoong, another relatively unknown fighter who entered the tourney via qualification, but who thrilled the crowd as he fought through to win a silver medal in Wuxi in the Men’s -80kg category. The two Russians in the division are both highly professional and are definite contenders. Roman Kutnekov and Vladislav Larin. Larin is slim for this category, but appears to be as strong as his opponents, and has the advantages of speed and a mastery of machine gun kicks. Moreover, Team Russia has had an excellent year in 2017, taking the number two spot behind Korean in the year’s Grand Prix series. On the other side of the match tree is the towering sensation from Niger, Abdoul Issofou. The 2016 Olympic silver medalist won the MVP award at the Worlds in Muju in 2017 and is a canny fighter with both height and speed. Then there is World Champion Alex Bachman of Germany, who surprised the crowd with his win in Muju, beating Larin in the finals. And Great Britain’s Mahama “It’s Cho Time!” Cho, one of the most entertaining fighters among the heavyweights. Cho boasts a wide technical arsenal, and is backed by first-class coaching. Finally, Kyo-don “The Bear” In – who recently won a battle with cancer – has been working his way back to the highest level of the game. Issofou is especially visible, and not just due to his height. He has ambidextrous turning kicks and sound tactics. He waits until his opponent is in range before unleashing a front foot-back foot attack. His speed also defies his height – he is very fast – and can surprise with his head kicks. But this category could well be decided by physical preparation. 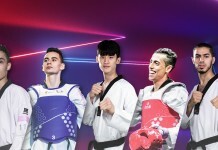 Unlike regular taekwondo matches, the Grand Slam features five, two-minute rounds for the medal matches, rather than the normal three, two-minute rounds. Athletes with technique will have an advantage other those who are simply big. In this sense, In and Cho and look good: Each of them is both big and technical.